Thomas Jefferson found the perfect man to lead the westward expedition in his protégé, Meriwether Lewis. To ensure leadership if Lewis in any way became incapacitated on the journey, Jefferson suggested to Lewis that he recruit a co-leader. On June 19, 1803, Lewis wrote to William Clark asking him to share the command of the expedition. On July 29, Clark responded, “My friend I assure you no man lives with whome I would perfur to undertake Such a Trip & c as yourself.” This marked the beginning of one of the most famous partnerships in American history. 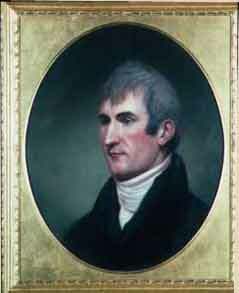 Meriwether Lewis painting by Charles Wilson Peale, from life, 1807. Courtesy of Independence National Historical Park. In the fall of 1806 Meriwether Lewis returned from the Voyage of Discovery to a hero’s welcome. The press and the public adorned him with adulation and President Thomas Jefferson rewarded his services with sizable pay, land in Missouri, and an appointment as governor of the Louisiana Territory. Three years later, the hero who had triumphantly led an amazing transcontinental journey met a sad, violent, and tragic death at the age of thirty-five. Meriwether Lewis was the first-born son of William and Lucy Lewis, a prosperous Charlottesville family. His father passed away when Meriwether was five years old. His mother quickly remarried and the family moved to Georgia, where he learned valuable frontier skills. At thirteen, Lewis returned to Virginia to begin a formal education and to learn the management skills necessary to run the plantation he inherited from his father. 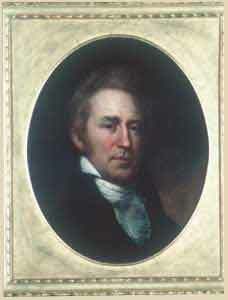 William Clark painting by Charles Wilson Peale, from life, 1807-1808. Courtesy of Independence National Historical Park. In September 1838 the citizens of St. Louis, Missouri, staged a large, elaborate funeral for one of their most distinguished residents, William Clark, famed explorer and Indian administrator. His death of natural causes at age sixty-eight made Clark among the last members of the Lewis and Clark Expedition to die. William Clark, the ninth of ten children, was born August 1, 1770, in Caroline County, Virginia. When he was fourteen, his family moved westward settling near Louisville, Kentucky. Here the sturdy young man quickly learned to be a skilled hunter and frontiersman. When old enough, he followed in the footsteps of his older brother, celebrated Revolutionary War hero and Indian fighter George Rogers Clark. The younger Clark moved up the ranks as an army officer, and Meriwether Lewis was assigned to Clark’s rifle company at Fort Greenville. Though they were not intimate friends, Clark made quite an impression on the more junior Lewis. When Jefferson instructed Lewis to find another commander for the expedition, Lewis believed there was “no man on earth” he would rather have join him than William Clark. 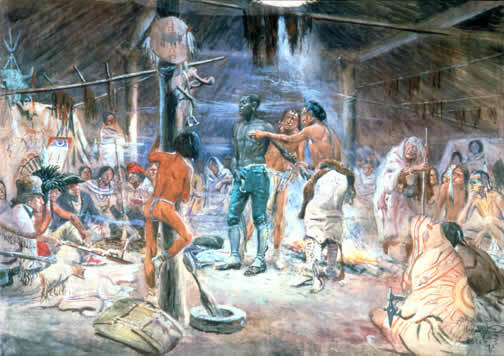 Clark’s military career prepared him to command military expeditions, construct and supply forts, and familiarized him with the ways of Native Americans. His primary duty was to be the expedition’s chief cartographer. The information garnered on the expedition (and improved upon by verbal reports of subsequent explorers) allowed Clark to draw a “radically new” and “remarkably accurate” map of the American West. Following completion of the transcontinental voyage, Clark received 1,600 acres of land, double pay for his services ($1,228), and a dual appointment as Brigadier General of Militia and Superintendent of Indian Affairs for the Territory of Upper Louisiana. He married Julia Hancock, and they named a son after Meriwether Lewis. After Lewis’s unfortunate death, Clark oversaw the publication of Lewis’s journals. In 1815 he became Governor of the Missouri Territory. He spent the rest of his life settling disputes between Indian and white settlers and creating treaties to appease both the American government and the Indian nations. Both men wrote extensively in their journals. Editor of the Lewis and Clark journals, Gary Moulton, writes, “In reading the journals we are in a sense traveling with the captains and sharing their day-by-day experiences and uncertainties.” Clark provides factual information and consistently makes daily entries. Lewis is the superior and more descriptive writer, yet there are months when he does not write at all in his journal. In addition to the leaders, other men kept journals including Charles Floyd, Patrick Gass, John Ordway, and Joseph Whitehouse. These can be accessed at the Journals of the Lewis and Clark Expedition Online. Captains Meriwether Lewis and William Clark desired only the healthiest, strongest, and most skilled men available to aid them in their transcontinental odyssey to explore the American West. Word of this remarkable mission quickly spread through the Ohio territory, and volunteers, excited by expectations of thrilling adventure, lined up to enlist. Lewis and Clark needed men to fulfill certain positions—hunters, blacksmiths, frontiersmen, interpreters, carpenters, and soldiers were all required. Equally important, the men chosen needed to be in top physical shape. In a letter to Clark, Lewis described the necessary physical characteristics as “stout,” “healthy,” and “capable of bearing bodily fatigue in a pretty considerable degree.” Private Alexander Hamilton Willard, a lucky appointee, recognized that his fine physique enabled him to pass inspection while nearly one hundred other men failed. Floyd’s Grave, Where Lewis and Clark Buried Sergeant Floyd in 1804 by George Catlin, 1832. Smithsonian American Art Museum, Gift of Mrs. Joseph Harrison, Jr.
Evidently, Lewis and Clark did their job and chose men healthy and hearty enough to withstand the harsh elements of nature, hunger and starvation, and countless diseases and injuries. In the two years, four months, and nine days of this physically and mentally challenging overland journey, there was only one fatality—Sergeant Charles Floyd died on August 20, 1804, of a probable ruptured appendix. He was buried on a bluff overlooking the Missouri River in what is now Sioux City, Iowa. At mission’s end, Lewis wrote that the Corps’s volunteers were entitled to his “warmest approbation and thanks” for the “manly firmness,” “patience,” and “fortitude” with which they “submitted to, and bore, the fatigues and painful sufferings” of the westward exploration. Sergeant Charles Floyd: William Clark described Sergeant Floyd as “a man of much merit.” Floyd, the first volunteer to serve in the Corps, also has the unfortunate distinction of being the excursion’s first and only fatality. The captains diagnosed him with “bilious cholic,” but medical historians now believe Floyd died on August 20, 1804, from a ruptured appendix. A large, one hundred foot obelisk, similar to the Washington Monument, marks his gravesite near present day Sioux City, Iowa. Sergeant John Ordway: “I am So happy as to be one them pick’d Men,” John Ordway wrote his parents. Ordway issued provisions, appointed guard duties, kept all registrars and records, and commanded the men in the absence of Lewis or Clark. His journal provides insights into Native American life. Sergeant Nathaniel Pryor: Nathaniel Pryor was described as a “man of character and ability.” He presided over the court-martial of two privates charged with being drunk on duty. Pryor disciplined them with one hundred lashes. Corporal Richard Warfington: An excellent soldier, Richard Warfington was entrusted with the command of one of the three expedition boats on the first leg of the journey to the Mandan villages in what is now North Dakota. He was put in command of the return party to St. Louis and was responsible for transporting members of the Indian nations who agreed to meet with Jefferson, journals, and specimens. William Bratton: Highly skilled, Bratton was an expert woodsman, hunter, blacksmith, and gunsmith. John Collins: He was one of five chief hunters on the Lewis and Clark Expedition. John Colter: Another hunter, John Colter requested a discharge from the Corps after returning to Fort Mandan to become a trapper. He is credited as being the first white man to enter the area that is now Yellowstone National Park. Pierre Cruzatte: Of Omaha-Indian and French descent, Cruzatte spoke the Omaha language and was conversant in sign language, making him a valuable interpreter in contacts with Indian nations. Joseph & Reuben Field: These brothers were excellent woodsmen, hunters, and scouts. Joseph Field had worked at salts works prior to serving with the Corps of Discovery. Both Joseph and Reuben Field were members of the “nine young men from Kentucky” selected for the expedition. Robert Frazer: Frazer’s journal was never published and has been lost to history. George Gibson: Gibson was a woodsman, hunter, and a fine fiddle player. Silas Goodrich: Goodrich performed routine tasks in addition to fishing. Hugh Hall: Hall was noted mostly for his drinking bouts during the expedition. Thomas Proctor Howard: Howard has the dubious distinction of being the subject of a court-martial for sneaking back into Fort Mandan after a late night visit to the Mandan Indian village. Francois LaBiche: Able to speak French and some lower-Missouri Indian languages, he became a valuable interpreter in addition to being an experienced boatman and frontier trader. Jean Baptiste Le Page: A French Canadian fur trader living with the Hidatsa and Mandan Indians, he joined the Lewis and Clark Expedition in North Dakota. Hugh McNeal: Very little is known about McNeal. John Potts: A German immigrant, Potts was a miller. George Shannon: At eighteen, George Shannon was the youngest private. John B. Thompson: Very little is known about Thompson except that he was a surveyor. Peter M. Weiser: After the mission, Peter Weiser became active in the fur trade. William Werner: Werner served satisfactorily, but without distinction. Joseph Whitehouse: Whitehouse’s journal was published in fragmentary form. Alexander Hamilton Willard: Blacksmithing was Alexander Willard‘s trade. Richard Windsor: Richard Windsor was one of the expedition’s most productive hunters. Toussaint Charbonneau: Lewis described Toussaint Charbonneau, a French Canadian fur trader and interpreter, as “a man of no peculiar merit.” Valued for his cooking abilities, Charbonneau was also married to Sacagawea. Sacagawea: Shoshone wife of Toussaint Charbonneau, Sacagawea was approximately sixteen years old when she became a part of the expedition. Jean Baptiste Charbonneau: The baby of Sacagawea and Charbonneau, Jean Baptiste, was fifty-five days old when the expedition left Fort Mandan. William Clark nicknamed the boy “Pomp” for his pompous “little dancing boy” antics. Clark raised Jean Baptiste and funded his education. Baptiste Deschamps: This French boatman showed particular expertise navigating the waterways. Pierre Dorion: For twenty years Dorian lived with the Sioux Indians and was a talented interpreter and trapper. George Drouillard: George Drouillard was a skilled hunter, scout, and a vital interpreter, communicating through sign language. York: The only African-American on the expedition, York was the slave of William Clark. 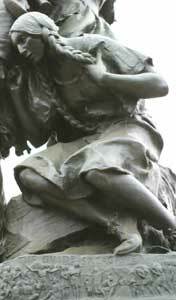 Sacagawea sculpted by Charles Keck in 1919, located in Charlottesville, Virginia. Sixteen years old and mother of a two month-old infant, Sacagawea was the only female on the Lewis and Clark Expedition. At the age of twelve, Sacagawea was kidnapped from her band of Shoshone Indians by a war party of Hidatsa Indians. Taken from her home in the Rocky Mountains to the Mandan villages near modern day Bismark, North Dakota, Sacagawea was sold as a slave to a French Canadian fur trader, Toussaint Charbonneau, and soon became one of his two Indian wives. The journey could not have been easy for Sacagawea. In addition to caring for a newborn child on the grueling expedition, her duties included digging for roots, collecting edible plants, picking berries, and serving as an interpreter. Lewis and Clark probably did not realize how valuable Sacagawea would be on their enterprise. Many Indian nations, feeling threatened by white invaders, would have been prepared to fight to defend their lands. However, when Indian tribes saw Sacagawea, they often interpreted the explorers as friendly: a war party would never allow a woman in their midst—let alone one with a baby. York painting by Charles M. Russell. Courtesy of the Montana Historical Society, Gift of the Artist. York, the only African American on the expedition, was the slave of William Clark. When Clark’s father died, he willed York to Clark. It is possible that Clark and York were childhood companions. Clark brought his trusted “servant” along on the expedition and by all accounts York performed many duties admirably, including preparing meals, hunting, and tending to the sick. Native Americans, who had never set eyes on a black skinned person before, viewed York with great curiosity and amazement. On the trip, York was treated as an equal and he, along with Sacagewea, had voting privileges within the Corps. 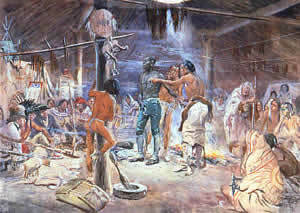 At the expedition’s end, Clark resumed treating York as his slave. Clark, relocating with his new wife to St. Louis, forced York to accompany them, even though York’s wife was owned in the Louisville, Kentucky, area. York, desperate to be reunited with his wife, pleaded with his master to free him for his service on the voyage. Clark stubbornly refused. Finding York insolent and sulky, Clark beat him and threatened to sell him to a more severe master. Clark finally granted York his freedom nearly a decade after the expedition. Seaman, purchased for $20 in Pennsylvania by Lewis, was the only animal to complete the entire round trip of the expedition. Lewis praised the “sagacity” of his Newfoundland dog who hunted squirrel and beaver, and even took down an antelope. He experienced injuries, including a beaver bite to his hind leg, and also suffered from mosquitoes and prickly pears.